Third in a four-part series. Click here to read the first part and here for the second. A partnership wasn't the original idea. The Nature Conservancy had bought about 10,000 acres of former timberland next to the Tahoe National Forest and was aiming to turn some of it into a wilderness area, where roads couldn't be built and timber couldn't be harvested. As wildfires spread, a battle rages over how to save America's forests. Click here to view the series. That set off alarms at the water agency, which had recently seen tens of thousands of acres of its watershed go up in flames in the King Fire, sending tons of sediment into reservoirs and forcing hydroelectric facilities to close for weeks. Without roads to access the forest, how would firefighters stop the next wildfire? "They were understandably concerned," said Ed Smith, a forest ecologist with the Nature Conservancy who's helping manage the work. "They had concerns about how to manage wilderness for fire. They really wanted to know our intentions." What emerged was a discussion about how each group could achieve its goals. The wilderness area would be limited to higher elevations that aren't as susceptible to big fires, the Nature Conservancy said. On the flip side, the agency could count on TNC and another group, the American River Conservancy, to help thin other areas around the reservoirs to reduce fire threats and promote more diverse wildlife. In some places, trees are being thinned from as many as 400 per acre to 50, which forest managers say is more typical of what those forests were like decades ago, before the natural cycle of wildfire was interrupted by the Forest Service's policy of putting out all fires. "It was born out of an understanding of mutual objectives," Smith said. "Since then, it's been a very productive relationship." Cooperation among groups won attention recently from Agriculture Secretary Sonny Perdue, whose department oversees the Forest Service. At a roundtable discussion with lawmakers and Forest Service officials in May, Perdue said the Department of Agriculture's view that actively managed forests are healthier is gaining traction with some organizations. "We're seeing some of the more moderate environmental groups coming on board and recognizing that," Perdue said at the roundtable, held at USDA headquarters in Washington. Smith, a forest ecologist and project manager in Arizona before coming to California, said the cooperation has helped to break a forest management stalemate brought on by the threat of lawsuits over every forest management project at the Forest Service. 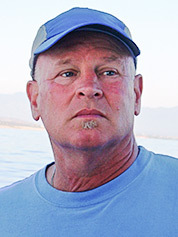 Environmental laws were enacted for good reasons, Smith said, "But now we're up against a different landscape," he said. "We're being penalized for doing something good for the landscape. What we're doing here is for the public good." 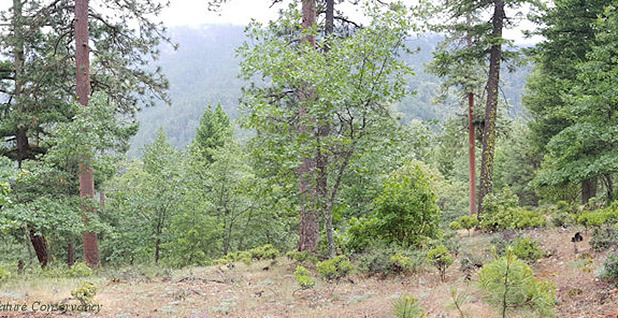 The marriage between the Nature Conservancy and advocates of forest thinning grates Luke Ruediger of the Klamath Forest Alliance, an Orleans, Calif., conservation group. Ruediger, who has designed forest restoration and defensible space plans to protect homes in fire-prone areas, said TNC has joined the logging industry's embrace of "active management" — a euphemism for taking more trees off the land in the name of preventing catastrophic wildfire. That's "fear-based forestry," he said, and overblows the threat of wildfire, especially in places not very close to homes or other buildings. "Essentially what's driving the debate now is either we log these environments or we lose them to fire," Ruediger said. 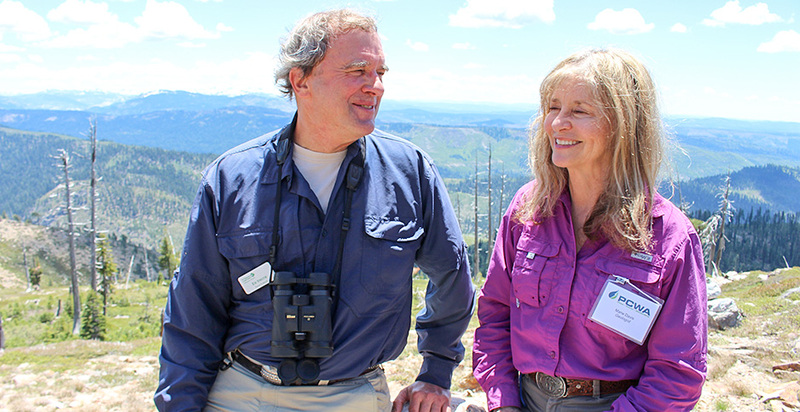 That approach is happening in other places, too, as the Nature Conservancy broadens its focus from buying and protecting forests to working with the federal government on public lands projects. "That's a huge shift," he said. Another example is the Rogue Basin Cohesive Forest Restoration Strategy, which TNC crafted in 2017 for 4.6 million acres in southern Oregon. That plan, designed in coordination with the Forest Service, Bureau of Land Management and Oregon Department of Forestry, advocates increased logging, forest-thinning and controlled burns as a way to make the forest more resilient after decades of management that excluded fire. In the strategy, the Nature Conservancy noted "significant" economic benefit from selling timber over 20 years. Treating up to nearly a million acres of federal land would cost about $30 million a year, including burning piles of thinned-out wood, and generate 66 million board-feet of saleable timber annually. "Further return on investment is a more fire resilient landscape and significant economic activity annually with 1,700 direct and indirect jobs that produce $65 million in local wages, and generate over $260 million in local economic output," the Nature Conservancy said in the strategy. By supporting large forest-thinning projects, the Nature Conservancy overlooks the nuances of forest management, said Randi Spivak, public lands program director for the Center for Biological Diversity. Selective thinning is a good idea near the wildland-urban interface, and in parts of New Mexico and Arizona, where the groups work together, she said. But thinning "is not the panacea people make it out to be," she said. Spivak said she was troubled to see the term "longevity thinning" in environmental review documents related to the Placer County project — a term that implies the work will aid the long-term health of the forest but which she said she finds "ridiculous." "These are logging projects. Let's not call them thinning projects," Spivak said. Policymakers would be wiser, Spivak said, to focus on establishing defensible space around homes, an area of more consensus to scientists. 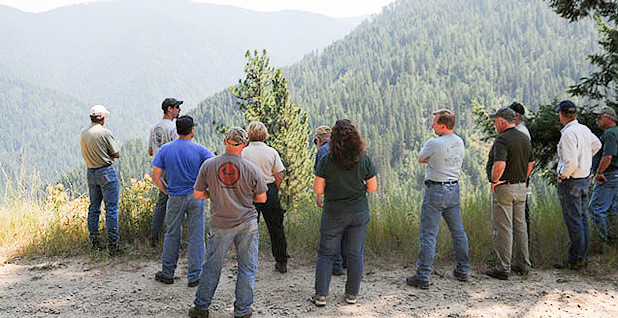 Groups such as the Nature Conservancy gain influence with the Forest Service as budget-constrained officials look for nonfederal "stewards" to speed forest management projects, which otherwise can become caught up in years of environmental studies and legal challenges. Whether that's good news depends on one's perspective. Collaboration "sounds good" but can shut out other voices on proposed forest management projects, said Gary Macfarlane, ecosystem defense director for Friends of the Clearwater, an environmental group in Idaho that opposes much of the active management the Nature Conservancy pursues. "It's backroom dealmaking." Other forest policy insiders, including some critical of logging practices, say the Nature Conservancy is on the right track. "I'd say they've started to assert themselves more," said Jim Furnish, a retired deputy chief of the Forest Service. While forest thinning should be applied cautiously depending on forest types and shouldn't be motivated by timber interests, he said, the Nature Conservancy brings credibility and resources to Forest Service projects. "I've had pretty high respect for the Nature Conservancy for a long time," Furnish said. "I actually welcome the role they're playing here." At the water agency, managers who remember the King Fire and its aftermath say forest officials can't work fast enough to make the land more fire-resilient. And a subject that's usually politically divisive — climate change — may actually help unite groups, said Andy Fecko, Placer County Water Agency's spokesman. "I think the climate change discussion has actually brought folks together," Fecko told E&E News on a tour of the agency's forest watershed. Before wildfires here became bigger and more severe due to drought, he said, "climate change was nebulous." "Once you get enough buy-in, you get some social license to begin doing some things," he added, noting the debate about whether human activity is behind climate change doesn't matter as much as dealing with the effects on a local level. "The politics of it all sort of fades away, and you can start to get down to doing some work."